With what has become boring regularity, and I really don't know why I continue to bother, my attempt to make a 15th birthday cake for my youngest turned out a disaster. So bad, it was not good for anything but the bin. 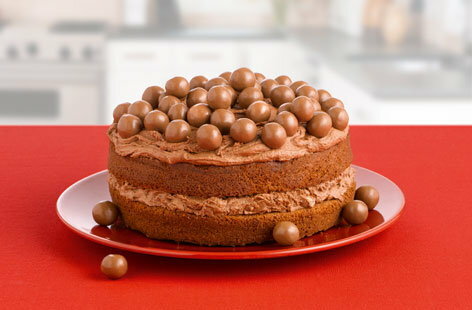 A layered cake with Ovaltine and chocolate sponge and Ovaltine-flavoured icing, and lots of Maltesers. Recipe here. Well, I don't have the right sort of cake tins, so thought it wouldn't matter if I made a single layered cake and just plastered it all over with icing and Maltesers. An inch thick at the edges, what happened to the raising agents, eh? Buggered off on a weekend break? This wouldn't have been so bad if the cake had tasted good. But it didn't. I got my son to taste a bit and he started off by saying it was nice... then... discovered an unpleasant after-taste. At that point I gave up and decided to throw money at the situation. Mousse au chocolat noir, croustillant praliné, biscuit Joconde.. It was, of course, heavenly, and went down a storm with the four boys. My son had 3 buddies to spend the afternoon mucking about, then I took them to KFC, and left them with a bucket. They found their own way to the cinema to watch 13 Hours, and I picked them up after midnight outside the cinema, brought them home whereupon they took over the living room with mattresses and bedding and were still there at 11.30am the next day (watching tele and playing XBox) when the mother of one arrived to pick him up. The others stayed to lunch (nems) and continued mucking about for the rest of the afternoon. My son had a lovely birthday. Lots of trashy food, fresh air and fun. I kept out of the way except for providing vital services (taxi, food), and spent the afternoon trying motorbikes with my DB (Honda, new BMW GS, BMW X), dinner with friends, and having lunch in la Grande Motte on Sunday in the glorious sunshine. I was shattered by Sunday night. "Mousse au chocolat noir, croustillant praliné, biscuit Joconde.."
Just the title, never mind the picture, is making me hungry from 2,000 miles away! Ha! Always look forward to hearing about your birthday cake stories. Blimey, that one's flatter than mine when I give it a go (not very often). Glad the party went well - good idea to just let them get on with it. At 15, a mother is best appreciated by her absence. Haha sifting!! The last time i baked i was wearing big eyebrows and a puffball dress so you are well ahead of me. My friend tells me quick and easy, mix melted chocolate with store-bought custard and pour into store bought pastry. It is amazeballs. Happy Birthday to your son. I know he would have appreciated it!